Who is behind The Unchargeables? This community is set up by one but run by many. Read this page to meet the team! My name is Natalie, I am the founder of The Unchargeables. It started as a Facebook page, later we (me and my fellow admins) added the closed support group for chargies and for caregivers and now I have also built this website. I am a single mother who suffers from Hashimoto’s Thyroid disease, Fibromyalgia, Raynaud’s disease and Celiac disease. I can not keep a full time job because of my illness, so I decided to sell teeshirts online to support myself and my daughter. I use the Facebook page and support group as my own support system too. It helps me deal with life as a chronic illness warrior. You can read the entire story here, about how this community came to be and how it grew into the amazing thing it is today. I’ve been living with chronic illnesses since I was a pre-teen…I just didn’t know it then. I was diagnosed with “allergies which could cause anxiety and depression” as a teenager (Yeah, I don’t know either…LOL! ), but everything else was “in my head”. It wasn’t until I was about 30 years old that I finally found a doctor who agreed with me that something wasn’t quite right. She decided to tackle my symptoms individually, instead of grouping them all together, and that is when answers finally came rolling in. I’ve since been diagnosed with Delayed Sleep Phase Disorder (DSPD), Severe Reverse Abnormal Migraines, Fibromyalgia, Bipolar Disorder Type II, Anxiety, Depression, Hypothyroidism, Tachycardia, Severe Hay Fever, and now Complex Regional Pain Syndrome (CRPS). One of my biggest joys comes from working for The Unchargeables as Natalie’s Executive Assistant. I help manage anything and everything shop related. All the behind the scenes stuff comes across my desk at one point or another…LOL! 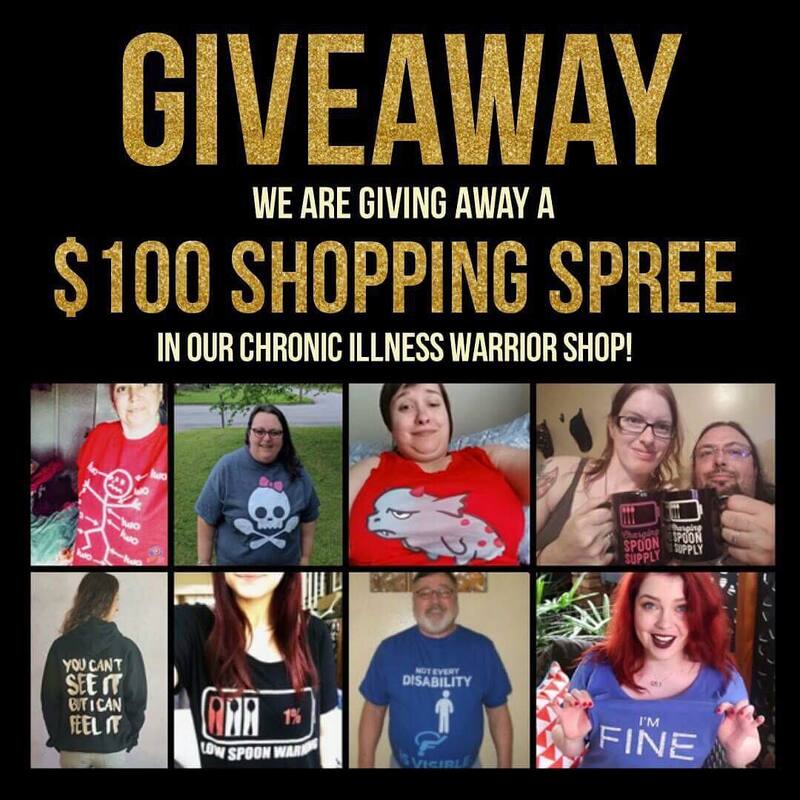 But most importantly, I get to see how much this community is helping everyone struggling with chronic illness. Being a Chargie gives me strength, courage, and hope to continue to fight through the hand dealt to me. November 17, 2015. The day my life was turned completely on its head, and I went from being a somewhat healthy normal 20 something to a Chronic Illness Warrior. I was diagnosed with MS on that day. two short years later and here I am, stable in my disease thanks to a delicately balanced combination of modern medicine. I’m a freelance editor by day and cat mom by night. Besides making bad puns, knitting, crocheting, editing, and writing, I fill my days by working here in the community with Natalie and Tracie in the shop and with our Twitter team, helping to drive new and exciting products and content. Being a part of The Unchargeables has truly been a wonderful experience and support for me and I am forever grateful to have found a place in a community I love so much, where I can continue to grow and give back. Ami has been disabled for six years with DDD, herniated and bulged discs, spinal stenosis, severe spinal arthritis, and severe sciatica. She also has PCOS, Endo, kidney disease, pleurisy, open heart surgery, COPD, PTSD, Carpal Tunnel, and manic depression. Creating this photo took a weeks worth of spoons away from her, but she wanted to showcase her passion. She was a Fire Performer, prior to becoming too disabled to do it any further. Ami is admin of the Unchargeables Facebook page and both support groups. Vanessa is a Chargie mom with three kids. She has Fibromyalgia as well as several other conditions that range from sensory processing disorder to mental health issues. She enjoys managing a few online support communities for people with chronic illness, and helping spread awareness and compassion. Vanessa is an editor here at TheUnchargeables.com, and admin of the Unchargeables Facebook page and both support groups. You can follow her daily grind here. Welcome! I am a mother to four young-adult children (3 step) who are in varying stages of learning to “adult.” Between college, career, marriage and parenthood, they keep me on my toes! I have two lovely granddaughters that I get to spend the occasional weekend doing crafty and educational activities with (and then I nap for two days after!). While my husband does not always understand my fibromyalgia, he is still my best friend- and, believe me, he keeps me busy going (way) up north to my parents cabin most summer weekends, and often in the winter as well. He is the true outdoors guy- hunting, fishing, and helps my parents with their enormous garden, plowing, planting and being an all- around Mr.-Fix-It! I read incessantly, and will read almost any genre. I enjoy travelling, especially camping, and I have camped throughout most of the US and Canada, as well as Ireland. Unfortunately, I don’t get to go as much as I used to, and I get really itchy feet to go! I also like to learn new types of crafting (you should see my Pinterest boards!) I have recently begun to do some wood burning, and I really enjoy many types of painting. I am currently working from home on several projects after leaving a 25-year career in special needs services including: Braille assistant and paraprofessional in the local high school, ABA in-home therapist for children on the autism spectrum, and Daily Living Skills teacher for adults with disabilities. Helping others is an intrinsic part of who I am, and I am learning how to do this in new ways now! Katrina is admin of the closed support group. Marc has been a chargie since 2006. When he got injured in the US Navy. This lead to him getting fibromyalgia and a host of other ailments as the years progressed. After traditional medicine failed to treat his conditions he tried the use of cannabis. You can read that story here. Now, Marc is a cannabis scholar and blogger at www.fibroman.com where his goal is to spread cannabis knowledge and help break down the stigma that comes with medical cannabis use that he feels steams from inaccurate and misinformation about cannabis in general. Marc found a passion for helping people overall and has also taken on admin duties of the Unchargeables support group and our weekly YouTube show Plug In With The Unchargeables. Kate has been a chargie practically her whole life, born with Dandy-Walker Syndrome and Hydrocephalus she was first shunted at four months. The chargie label didn’t come till some serious surgical complications left her relearning how to walk. Now she has also been diagnosed with Carpal Tunnel, PCOS, depression and the list seems to keep growing. Kate is admin of the closed support group. Hi all! I’m Dena & I have been one of the admin here at The Unchargables for quite a at long time, almost since the beginning but not quite. I am a medical zebra, meaning I have at least one rare condition. I have hyper mobile Ehlers Danlos syndrome, mast cell activation syndrome, POTS, asthma, degenerative disc disease, systemic arthritis, TMJ, seasonal allergies, probably Sjögren syndrome and a bunch more. I was a rehabilitation counsellor and mental health counsellor for a number of years before I had to take disability due to my disability. The most serious (to them) were my inability to sit, stand, or type for prolonged periods of time. I also can no longer be around people wearing fragrance or who smoke. Now I volunteer here and at other support groups. I wish you all a warm welcome and as many charges and spoons as you need. My name is Alis/Janice. I have RA, fibro, migraines, depression, bi-polar, and a few other undiagnosed ailments. I love crafts (lately has been crochet and acrylic painting). I’m also a huge nerd and enjoy playing Dnd, video games, occasionally watch anime, and also run a guild on a popular Mobile game. I was in aquatic industry for 15 years before I walked away to pursue a better career path. I work full-time in customer service for an American retail corporation. I’m very much an introvert. I have 2 dogs, one of which is my life and ESA (emotional support animal). I live in south Central PA in the USA and dream of travelling the world. I’ve been apart of The Unchargables since November 2016 and it’s changed my life for the better. Shannon O’Connell started exhibiting signs of autoimmune disease just after graduating from Oklahoma State University in 2005. She enjoyed a brief remission for 2 years in 2010 and 2011. Then a major flare hit and her mixed connective tissue disease evolved to Rheumatoid Disease and Systemic Lupus Erythematosus. Fibromyalgia came out a few years later. After going medically disabled from her job as a brand manager and account executive for an award-winning advertising agency, she now expresses her creativity by writing, diy decor, knitting and crochet. Her life-long passion for stories means you’ll most likely find her reading or listening to audiobooks on her down time. As a triple Chargie, Shannon pushes to care for her boyfriend and two step kids–a girl (7) and boy (6). Her dog Diesel is the keeper of her sanity on long, painful days. Finding a fellowship with The Unchargeables has been a blessing and she has been serving the community as an admin for about a year. Winslow is a former teacher and geriatric specialist. She is a current author and holistic health coach. “My biggest desire is to help others realize that chronic illness is NOT a death sentence. Life can and does go on. I almost lost my life on my 23rd birthday due to Addison’s disease, which is total adrenal failure. It was caused by the stress my body struggled with because of my congenital disorder, Medullary Sponge Kidney. This disorder causes me to have daily kidney stones, pain and constant infection. Along with the Addison’s disease, life is a challenge! If you have breath in your lungs, you have a purpose on this planet. Charlene has been a chargie since 2015 when she came down with a viral infection from which she never fully recovered. Before that, she had a wonderful job as a teaching assistant working with young children with special needs, tutoring after hours, and a busy social life. Within 6 months she was diagnosed with ME/cfs and her condition continued to deteriorate until she was bedridden at the start of 2017. Now, after she has had some improvement thanks to dietary adjustments and having a full-time carer, she spends the little energy she has watercolouring and blogging at www.chronicallyhopeful.com as well as admin duties in support groups online. She is passionate about encouraging others and helping them to navigate their new normal after diagnosis. Charlene is admin of The Unchargeables Twitter and Instagram accounts. Hey I’m Jen and I’m part of the Unchargeables volunteers team on Instagram. I’m 36 years old and was diagnosed with Fibromyalgia nearly 5 years ago now but like many of you my story started long before that. I have suffered with chronic migraines and menorrhagia since my early teens but when I had my son at age 20 things seemed to settle for a while. It didn’t last though. I underwent test after test before they finally landed on Fibromyalgia and was told there was nothing to be done, I’d just have to accept this as my new life. I joined the Unchargeables team in the hope of spreading the word to fellow chargies that you are not alone and you’re stronger than you think!